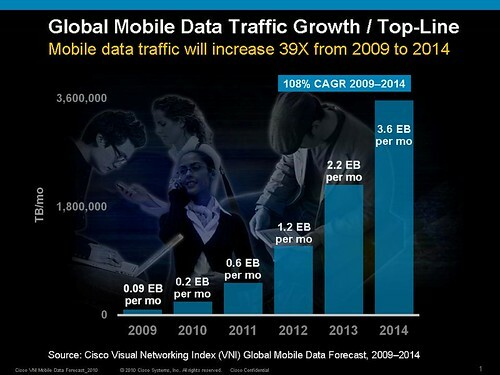 Cisco announced new marketing data projecting a 39-fold increase in Mobile data traffic from 2009-2014. San Jose, Calif., Feb. 9, 2010 – Cisco today announced the results of the Cisco® Visual Networking Index (VNI) Global Mobile Data Forecast for 2009-2014. The research projects that annual global mobile data traffic will reach 3.6 exabytes per month or an annual run rate of 40 exabytes by 2014. Such a figure equates to a 39-fold increase from 2009 to 2014, or a compound annual growth rate (CAGR) of 108 percent. Two major global trends are driving this increase-the proliferation of mobile-ready devices and widespread mobile video content consumption. By 2014, there could be over 5 billion personal devices connecting to mobile networks – and billions more machine-to-machine nodes. Mobile video is projected by the study to represent 66 percent of all mobile data traffic by 2014, increasing 66-fold from 2009 to 2014-the highest growth rate of any mobile data application tracked in the Cisco VNI Global Mobile Data Forecast. 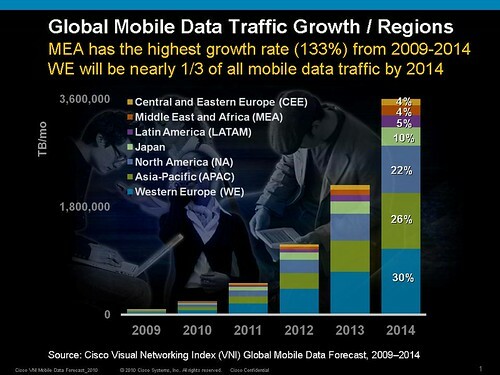 Global mobile data traffic today is growing today 2.4 times faster than global fixed broadband data traffic. Smart phones and laptop air cards are expected to drive more than 90 percent of global mobile traffic by 2014. If you aren’t thinking about mobile data out of your data center, you will be. This marketing data coincides with their new mobile data switch, ASR 5000. SAN JOSE, CA, Feb. 9, 2010 – Cisco today announced it has expanded the ASR Series platforms with the introduction of the Cisco ASR 5000 as a result of the Starent acquisition. 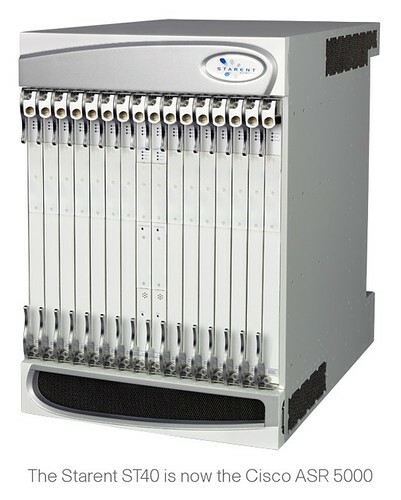 The addition of the ASR 5000 gives Cisco a comprehensive end-to-endInternet Protocol Next-Generation Network (IP NGN) architecture and offers mobile operators a platform specifically designed to accommodate the rapid growth of mobile Internet traffic and mobile multimedia applications.